An do chaill sibh Coisir Ghàidhlig Lodainn nuair a bha iad ann am Pàrlamaid na h-Alba an t-seachdain sa chaidh? Seo criomag dhuibh agus iad a’ seinn Suas leis a’ Ghàidhlig ann an Café Bar na fèise. 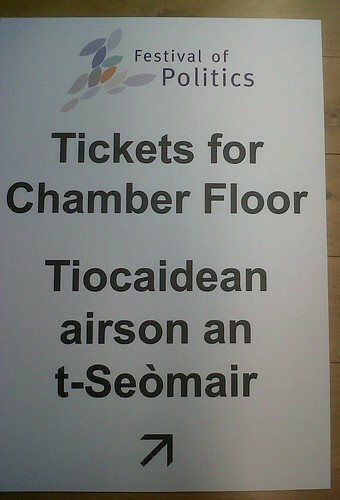 Tha am program airson Fèis Poilitigs 2011 ri fhaighinn sa Ghàidhlig a-nis bho làrach-lìn na fèise. Is e cuspair Fèis na bliadhna seo “Ag Ath-nuadhachadh Poilitigs ann an Linn nam Meadhanan Ùra” agus bi gu leòr de thachartasan ann co-cheangailte ris na meadhanan sòisealta. Bidh tachartasan ciùil gu leòr ann cuideachd. Tha an fhèis air Facebook is Twitter cuideachd.